With just six weeks to go until the start of the thirteenth annual School Games National Finals at Loughborough University we spoke to Jess about her recent experience at the Commonwealth Games in Australia, her memories of the School Games, and her advice to more than 1,200 young athletes as they prepare for this year's competition. Jess competed twice at the School Games before progressing to compete against the some of the world's best - including earlier this year at the Commonwealth Games. Jess is no stranger to Loughborough University Campus, which will host the multi-sport event for the third successive year this coming August and September, where she remains a student - in her final year of studying Human Biology alongside her athletics. However, her first experience of the world renowned venue came back in 2010, when aged 15 she attended the School Games for the first time. She would return again in 2011, both times competing in the 1,500m, both times walking away with a gold medal. However, she has said that for her the event was about a lot more than just the result: "I loved the School Games," she says. "It was my first experience of a multi-sport environment and it helped make me that little bit more prepared for the big events. It was great to get out of the athletics bubble and embrace other sports going on at the same time." 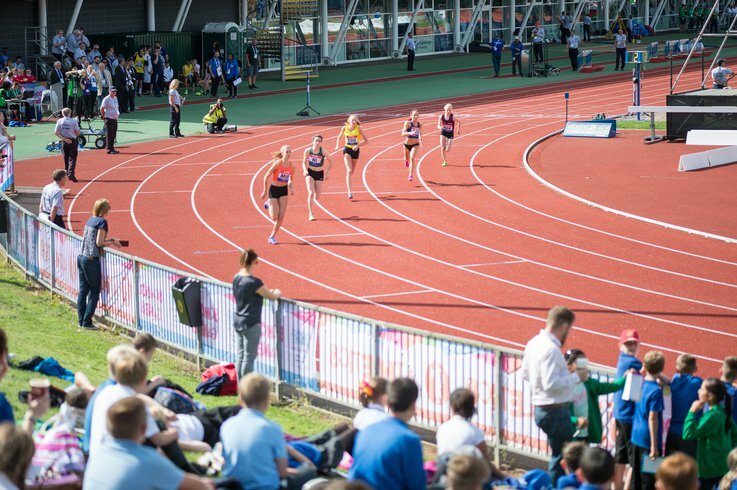 More than 20,000 young athletes will have competed in the School Games by the time this year's competition comes to a close, many of whom have gone on to enjoy national and international success, including the likes of Adam Peaty, Dina Asher-Smith, Ellie Simmonds, Hannah Cockroft, Jonny Peacock, Max Whitlock and, of course, Jess who reached the final of the 1,500 metres in the 2018 Commonwealth Games in Australia. There were over 200 School Games alumni on the Gold Coast and Jess believes that this is evidence of the long-term impact the Games is having on her sport: "I think it makes you want to experience a similar environment at a senior level," she agrees. "As a junior athlete you get an idea of what these big competitions are like from the School Games and for me especially I thought that it was great and I wanted more of it. It drove me on to work hard and knuckle down and make a senior multi-sport event." For athletes like Jess the School Games offered the opportunity to meet like-minded people, including fellow distance runner Katie Snowdon, who would go on to become a close friend and her roommate at the Commonwealth Games. The pair even raced in the same heat at the Games, finishing within a second of each other, and both competed in the final - won by two-time Olympic 800m champion Caster Semenya. Despite limited training due to her University studies and stiflingly hot conditions - at times more than 30 degrees warmer than the UK - Jess performed brilliantly to make it out of the heats in a time of 4:08 which she matched in an incredibly competitive final, when more than half the field broke personal, seasonal or national records. "Australia was amazing," she enthuses. "I think me and my team always knew it was going to be difficult to be in the best shape in April so we did the best we could. I was really happy to run 4:08. It was slightly disappointing to not finish higher up in the race but there’s not much you can do when the other girls are just better than you on the day. What with the snow and cold weather during training, to make the final was a big achievement for me, and hopefully I can use that as a starting point to move through the rest of the season." Worryingly, Jess collapsed at the end of the race, as the hot temperatures finally took their toll and even now she remembers little about the final few moments: "All I can remember is hearing the bell and thinking I had to push on but the last lap is a total blank! I think it just felt so fast for that time of the season and I remember hanging on as best as I could but I was shocked with the girls being in such great shape. "I did give myself a really hard time originally as I wanted to do even better but all things considered we couldn’t have asked for much more. When I got back I was really deflated and tired but my team made me see that it was a good performance and I feel that only now have I really put it behind me and got my confidence back. I’m proud of the fact I gave it everything but at the same time it hurt to know that whilst I might have given everything, I couldn’t finish higher up in the race. I don’t think we were under-prepared, I just think that was the best I could do at that point in the season and although it was hard to deal with, I'm determined to use it as a positive moving forward." Indeed, looking back now more than three months on, she is very positive about the overall experience despite the various challenges: "It was hard being so far away from home. The jet lag really affected me and with my dissertation to think of as well I only had two weeks out there before the race so getting used to the time zone and the heat was a big rush! It was difficult talking to my dad and boyfriend too as they were asleep when I was training but it was a great experience and a great chance to be more independent. "The crowd was great throughout and the whole event was really well put on. Caster in particular is lovely and has always been really friendly to me and I always feel lucky to line up alongside her and the other girls. They are the best in the world and so to share a start line with them is great. I really don’t want to take anything for granted, as I had 2015 and 2016 where I watched on the TV, so to be in the mix with those girls is a dream come true and I’m just trying to enjoy every minute and do my best in every race." So, with one eye on the 2020 Olympic Games in Tokyo, Jess will begin to look forward to the rest of this season and next. She's also confirmed that she will be watching on with interest during the 2018 School Games, possibly looking out for the next wave of up and coming young athletes, for whom she had some sage words of advice. "I would just say to enjoy it. I think a lot of people can put pressure on themselves at such a young age and I wish I had just enjoyed those events a bit more. Although its a big event at that point in your career, hopefully you will go on and achieve even more and trust me, later on it gets a bit more nerve wracking. So just enjoy it, try your best and find out what you need to work on to keep progressing. Don’t be afraid to talk to new people and make friends. I have made friends for life and you could too. "For me, I am just aiming to continue racing well. I sometimes have a tendency to put too much pressure on my myself to run fast and forget that at the end of the day it's the racing that matters. I would like to just enjoy my running and hopefully get to the UK Trials in good shape, but this year I’ve already done a lot so I’m just going to take it one race at a time and see what happens." There will be 11 sports at this year's School Games National Finals. A full list of the ticketed events are available on the brand new National Finals website along with the event's schedule. We hope to see you there!